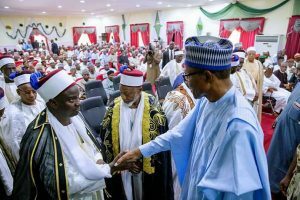 In Dapchi, Yobe State, President Muhammadu Buhari said his administration’s response to the abduction of 110 schoolgirls from Government Girls’ Science and Technical College, was better than that of President Goodluck Jonathan’s government. Boko Haram kidnapped 110 students from Dapchi, Yobe state on February 19, 2018, and also, abducted 274 students from Government Girls Secondary School, Chibok, Borno State, on April 14, 2014. At a meeting in Damaturu, the state capital, yesterday, Buhari said his government acted immediately it learnt of the kidnap of the girls at Dapchi. “The federal government’s response to the unfortunate abduction of the schoolgirls is a clear departure from the insensitivity of the past administration which looked the other way while the Chibok girls were taken away in 2014 and held in captivity for over three years,” he said. “Due to our commitment, over 100 Chibok girls have been rescued and reunited with their families, sent back to school and empowered with requisite skills. You may recall that recently, our negotiation efforts led to the release of abducted University of Maiduguri lecturers, some women police personnel, students and even an NYSC member. We, therefore, have no doubt that the Dapchi girls will be rescued or released. “I can reassure parents, Nigerians and the international community that we will do all that is within our power to make sure that the girls are brought back safely to their families. “I have directed the Nigerian Army, Air Force, Police, Department of State Services and the rest of the security agencies to find the girls wherever they are,” the president, who appeared sad, said at the meeting held in the school hall. He also promised that government would use “all its power” to direct the security agencies to end Boko Haram insurgency and bring peace to the North East. Buhari said he has read the full report of the abduction and that his visit was to console the parents, people and government of Yobe state. Earlier, at a meeting with stakeholders at the Government House in Damaturu, Buhari said anybody, group or agency found to be culpable of negligence, which may have caused the Dapchi abduction, will face the law. He was accompanied by the Minister of Information, Alhaji Lai Mohammed, Interior Minister, Abdulrahman Dambazau, Defence Minister, Dan Ali, Sports Minister, Solomon Dalong, Chief of Air force, Air Mashal Abubakar Sadiqque and DSS Director General, Lawal Daura. Governor Ibrahim Geidam and his Borno State counterpart, Kashim Shettima, received the president.